Serving our community through philanthropic activities are very important to our guild. Making quilts for newborn babies and wounded soldiers are just a few of the rewarding endeavors available for member participation. 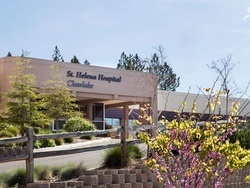 One of our community service projects consists of providing baby quilts to the OB unit at St. Helena Hospital, Clearlake for the newborns of deserving families. The nurses in that unit have requested 10 to 15 quilts per month. In order to keep up with the nurses request, we do need for everyone to help. The Community Service Committee has kits consisting of three layers. These have been cut but will need some adjustments to assure that all three layers are the same size. Another option, however, is for participants to provide their own "kits" or to make the quilts in any manner they choose. Keeping in mind they do not need to be elaborate. The sizes range from approximately 36" x 45" to 45" x 45". Click on the button below for instructions to make the baby quilt. Many thanks goes to those of you who have so graciously constructed baby quilts. The babies love them! Thank you! It is with great pride and gratitude that we were able to have participated in the Wounded Warriors program. 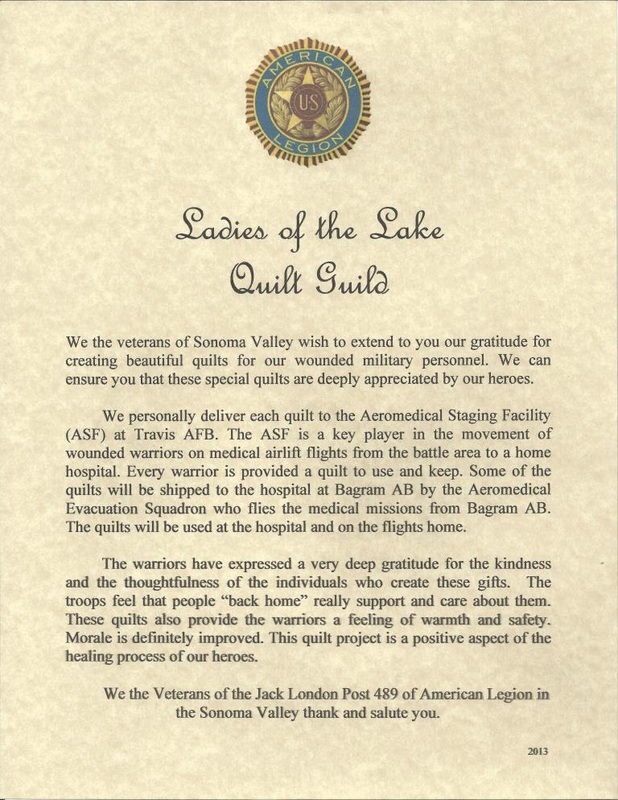 Guild member Donna Hodges coordinated the program in conjunction with the Veterans of the Jack London Post 489 of American Legion in the Sonoma Valley and Travis Air Force Base. 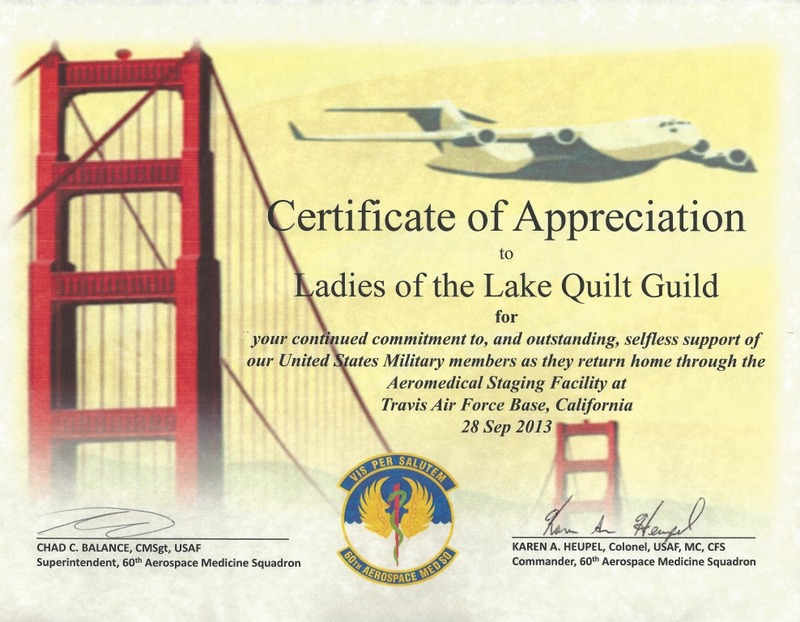 Over 40 members made quilts to be given to injured soldiers to cover them and hopefully provide some comfort as they flew back home from the war in the Middle East. We are forever grateful for their sacrifice and honored by their heroism. Thank you to all the guild members who participated. To view the members who participated in making the quilts, click here.